Puck Custom Enterprises, a prominent manure application equipment manufacturer in Manning, Iowa, has teamed up with Bauer Built Manufacturing to produce an innovative new toolbar. The technology, available this coming spring, was developed using Paton, Iowa-based Bauer Built’s years of experience manufacturing the DB planter line combined with PCE’s expertise in manure application. The product, called the Bauer Pull-Type Applicator, is PCE’s first front-fold, 45-foot applicator, which makes the process faster and more efficient. The toolbar allows for easier turns while in the ground and on the end rows, more travel per row and less maintenance. 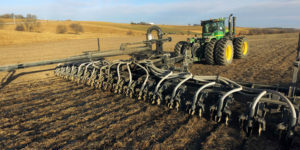 Some notable features of the new pull-type applicator include 800 series flotation tires, a coulter-style tillage tool called the New Torsion Flex Injector, and closers that contain a greaseless high-speed hub. It also offers 30-inch and 24-inch row spacings, along with the same eight-inch Swing Pipe used on PCE’s 4WD systems for better flow. The row unit can pivot up to 35 degrees, resulting in less stress when turning around in the ground. The Bauer Pull-Type Applicator will be available in the spring of 2018, and PCE is encouraging customers to call now (712-653-3045) to get their order placed. While the two Iowa-based agricultural manufacturing companies have worked together before, this product is another step forward and a further sign of their commitment to innovation.